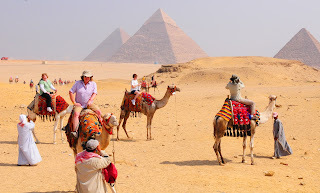 I visited all sites in Egypt, and i will advice you great advice, you will enjoy in any place in Egypt, Diving in the national parks in the red sea will give you great power during your enjoying watching corals and fish, the crystal water in Sharm, Hurghada and Marsa Allam will clean your soul from stress and tiredness. walking in old Cairo between the Islamic, Hebrew and Coptic monuments will give you great feeling and will take your imagination to the middle ages and how ُEgypt was the lighthouse of Knowledge and Development, and if you are in luxor, you feel how we are right now, and how they were. Pyramids will take you away from all, and you will can`t explain to yourself how did they build it. if you got tired from life requirements, and you would like to get power and energy, you should visit Egypt. My Next articles will be about ancient Egyptian capitals.